Second Clinician Biographical Information Musical ambassador and interpreter of America’s music, Wycliffe Gordon experiences an impressive career touring the world performing hard-swinging, straight-ahead jazz receiving great acclaim from audiences and critics alike. His unmatched modern mastery of the plunger mute and his exceptional technique and signature sound has solidified Gordon a place in musical history known as one of the top trombonists of his generation. 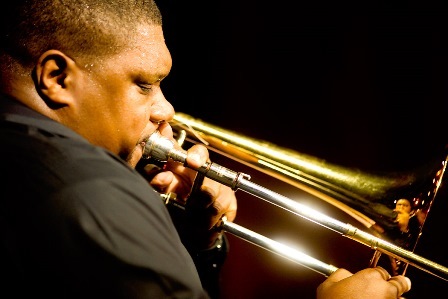 Wycliffe was named “Best in Trombone” by the DownBeat Critics Poll for 2012 and Jazz Journalists Association named him “Trombonist of the Year” again this year (2013) as well as previous years 2001, 2002, 2006, 2007, 2008, 2011 and 2012. He is a past recipient of the ASCAP Foundation Vanguard Award, among others. Gordon’s recordings are a model of consistency and inspiration, and his musical expertise has been captured on numerous recordings. He is commissioned frequently by renowned jazz groups and organizations, and has an extensive songbook of original compositions that span the various timbres of jazz music. Musicians and ensembles of every caliber perform his music throughout the world and his arrangement of the theme song to NPR’s “All Things Considered” is heard daily across the globe. Gordon is one of America’s most persuasive and committed music educators, and currently serves on the faculty of the Jazz Arts Program at Manhattan School of Music. He was awarded an honorary doctorate in 2006 from the University of Scranton, for his tireless dedication to the field. His work with young musicians and audiences from elementary schools to universities all over the world is extensive, and includes master classes, clinics, workshops, children’s concerts and lectures – powerful evidence of his unique ability to relate musically to people of all ages.